Barnes bullets have a truly storied tradition since their inception in 1932 when Fred Barnes began pressing his own rounds out of his Bayfield, Colorado workshop. With the introduction of the Barnes VOR-TX Polymer Tip 180gr .300 Win Mag, that tradition continues to push the envelope of bullet technology, and is unrivaled amongst large game hunters across the around. 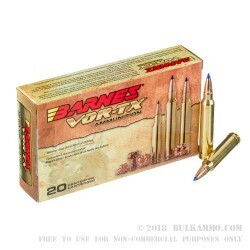 Barnes VOR-TX technology is some of the most lethal bullet technology on the market today. 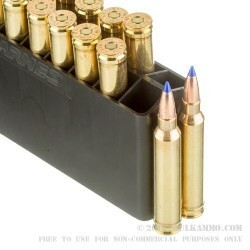 The polymer nose cap embedded into the bullet’s face stabilizes the round in flight at a truly bone crushing velocity of 3,010 feet per second. Upon impact, the polymer nose cone compresses along the rounds shank, facilitating the uniform expansion of the rounds hollow point petals, and encourages the round to mushroom to a width of over double its diameter upon entry into the terminal cavity. 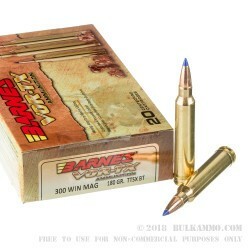 At a muzzle energy of 3,503 foot lbs, the Barnes VOR-TX polymer tip 108gr .300 Win Mag is capable of successfully hunting some of the largest game in the United States and Africa. Short of handloading your own ammunition, there is no fiercer round on the market capable of such a devastating degree of energy transfer. For those who are unwilling to settle for anything but the best, the Barnes VOR-TX Polymer Tip 180gr .300 Win Mag is one of the most powerful rounds to ever be factory produced.